SHOW ME THE MONEY IS BACK! I'm happy to announce that "Show me the money" is back! Mo Ly will be taking over from chapter 130! Mo Ly will be releasing 3 chapters, five days straight. Then, she plans to release 5 chapters per week until the novel is finished! Mo Ly is one of the newbies I have personally worked with. Some of you might recognize her name from UPX. Translating is very tough and most people tend to give up very quickly. However, Mo Ly has repeatedly proven herself to be reliable, consistent, and skillful over the past four months of working together. I am truly grateful to have someone like her on volare. 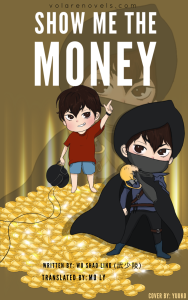 Please welcome Mo Ly and read SHOW ME THE MONEY here! Goddamnit! Now I've got to look for another job to pay the bills! That f*cker! I did nothing wrong! Huh? What's that? Eternal, a full dive VRMMORPG that gives you the chance to make real money? Perfect, that's exactly what I need! Now...What class should I pick? Warrior? No, I don't want to tank. Knight? Please, I already said I hate tanking. Healer? Oh God, please don't make me babysit people. Archer? Mage? No, I'll be too far from the loot! Rogue? Seems nice. We can steal stuff too? Perfect! Now... Show me the gold! Show me the cash! Show me the money! Note: Selutu translated the first 130 chapters of SMTM and is also the translator of Red Packet Server. Please check out his work as well if you haven't already done so! Over 750 chapters have been released for RPS!! Read RED PACKET SERVER here!